When we ponder some of the greatest man-made structures on the planet, we’re certain to come across some mind-blowing facts and figures. Two examples: first, the grandiose fountains at the Gardens of Versailles, which at one point in their history consumed more water per day than the entire city of Paris; and, despite the technology we have at our disposal today, Gaudí’s Sagrada Familia in Barcelona still being a work in progress, with its construction started in 1882. Such man-made wonders become symbols of not only the cities they belong to but also the entire nations. 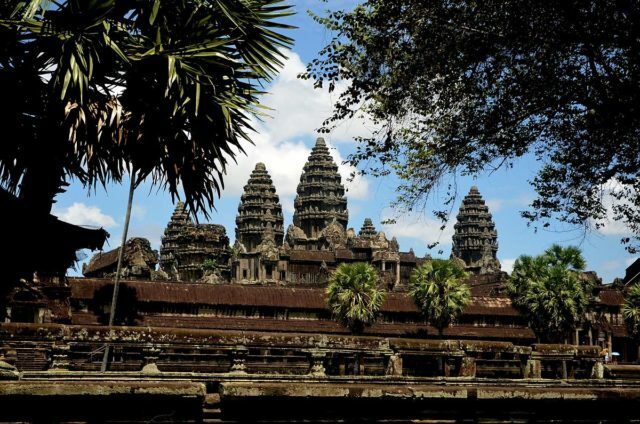 It is no different in the case of Cambodia’s Angkor Wat, arguably its principal symbol and a great source of national pride for this beautiful Asian country. One can become mesmerized by nearly any aspect concerning the monumental Angkor Wat, starting with the fact that the entire work is the architectural representation of the sacred Mountain Meru of Hindu mythology, a counterpart of Mount Olympus in Greek mythology. The statistics of how it was built and created are truly impressive. A superb illustration of the classical Khmer architecture, ever since it was first seen by Western travelers during the 16th and 17th centuries the temple complex of Angkor Wat has been a source of fascination and awe. 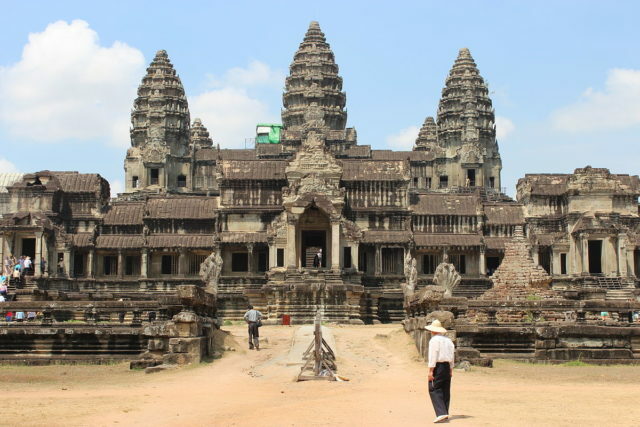 Initially, Angkor Wat functioned as a Hindu temple honoring the god Vishnu under the Khmer Empire, but by the end of the 12th century, it had transformed into a great Buddhist temple. The imposing beauty of Angkor Wat in Cambodia. Photo by Diego Delso, CC BY-SA 3.0. 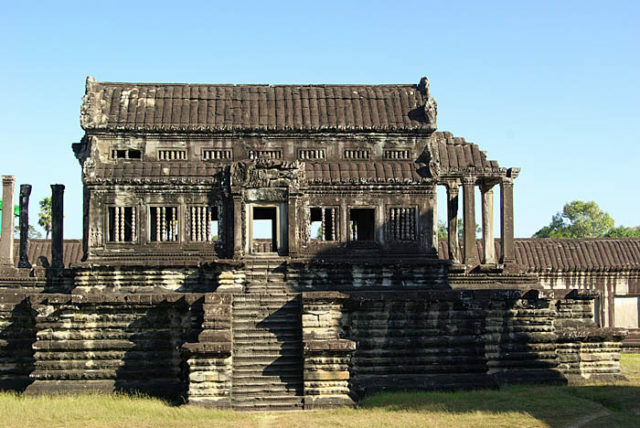 By the 12th century, Khmer architects were skillful and knowledgeable enough to make striking use of sandstone, rather than more the commonly used construction materials such as brick or laterite. Sandstone blocks form most of the areas seen by the naked eye of the holy site. Laterite was not used as the main building material and was more often used for parts like hidden structures or the outer walls of the architectural wonder. Northwest corner tower of the first gallery of Angkor Wat, viewed from the second enclosure. Author Unknown CC BY-SA 3.0. 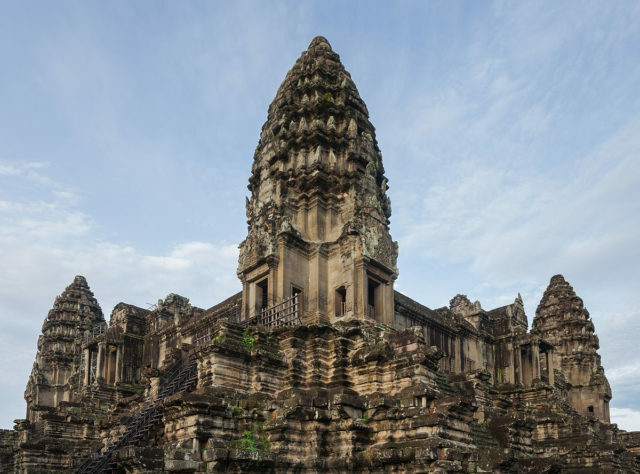 We might be more intrigued by the question of how the Great Pyramid of Giza was built, but it is similarly striking how Angkor Wat was built by the ancient Khmer architects. As smooth as highly polished marble, the stones that compose Angkor were laid without the use of mortar. The joints between the pieces are so tight that it is sometimes hard to even notice. The blocks were often held together by mortise and tenon joints at some points during construction. They were also constructed using dovetail joints and gravity. As different scholars point out, most of the blocks had holes 0.98 inches diameter and 1.2 inches deep in them. It is disputable whether iron rods might have been used to join the blocks as one group of scholars claim. Others have claimed that iron pegs may have been used temporarily to help maneuver the stones into place. Angkor Wat as viewed from the rear. Photo by James Mason-Hudson, CC BY-SA 3.0. It is an impressive fact that Angkor Wat was made out of at least 5 million and perhaps as many as 10 million sandstone blocks. The maximum weight of each block would have been roughly 1.5 tons. These numbers speak for themselves, as it means the entire city of Angkor used up far greater amounts of stone than all the pyramids of Egypt put together. Also, the monumental site occupied an area significantly greater than modern-day Paris. Furthermore, if the Egyptian pyramids frequently made use of limestone quarried in close proximity to the pyramid building sites, the entire temple complex was built with a sandstone quarried quite farther off in the mountains. The building resource was transported all the way from a quarry situated on Mount Kulen, some 25 miles northeast of Angkor. The Angkor Wat embraced by some wild vegetation. Photo by Ksuryawanshi, CC BY-SA 4.0. A few theories have been put forward to answer how the stone was moved from the mountain to the city. One suggestion is that the route involved 22 miles through a canal approaching Tonlé Sap Lake. From there it would have meant passing the lake for another 22 miles and finally nine more miles moving against Siem Reap River’s currents. Altogether, this route would have made for a journey of 56 miles. 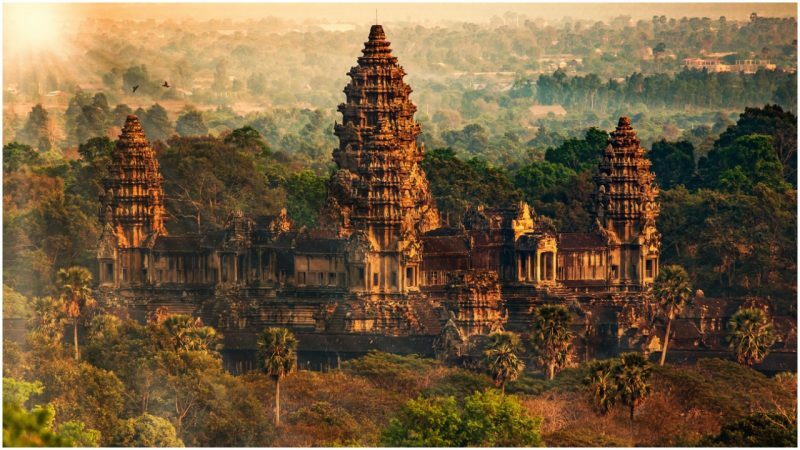 A more recent suggestion made in 2012 by two Japanese scholars, Etsuo Uchida and Ichita Shimoda, pointed out a possible shortcut, a 22-mile-long canal joining Mount Kulen and Angkor Wat. The discovery of this newly found route was made possible with the use of satellite scanning, and the two scholars have backed the idea that this may have been a more plausible route to use to bring the building resource to the construction site. Northern library of Angkor Wat. Photo by Stefan Fussan, CC BY-SA 3.0. What’s perhaps even more fascinating is that literally all of the facades, pillars, lintels, and even the roofs composing Angkor Wat are carved. The site is embraced with miles of reliefs illustrating scenes and depictions found in old Indian literature. The curious eye can come across the most unusual and mystical creatures, such as unicorns, griffins, or winged dragons pulling chariots. Other imposing depictions show warriors following a leader mounted on an elephant or celestial girls dancing with some intricate hair styles. View of the west wall of the outer enclosure of Angkor Wat. Photo by Michael Gunther, CC BY-SA 4.0. 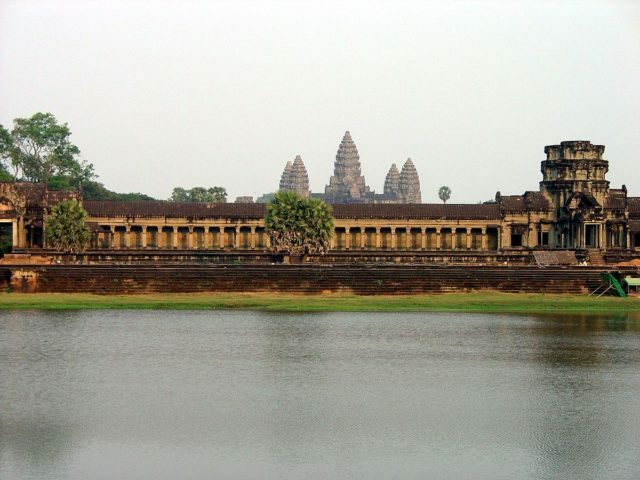 Experts such as Roger Hopkins and Mark Lehner have also conducted experiments to demonstrate the effort required to produce the entirety of Angkor Wat. One of the experiments conducted showed it took 12 quarrymen and some 22 days of work to take some 400 tons of stone. Not to mention the labor force needed for transporting the goods–it must have taken thousands of people to build the divine site. The skills needed to carve the reliefs were developed over hundreds of years before the monumental work was built, something proved by artifacts found and dated to the seventh century before the Khmer Empire came to prominence. If Angkor Wat had less than 8,000 travelers paying a visit to the site back in 1993, the numbers dramatically changed in a decade. 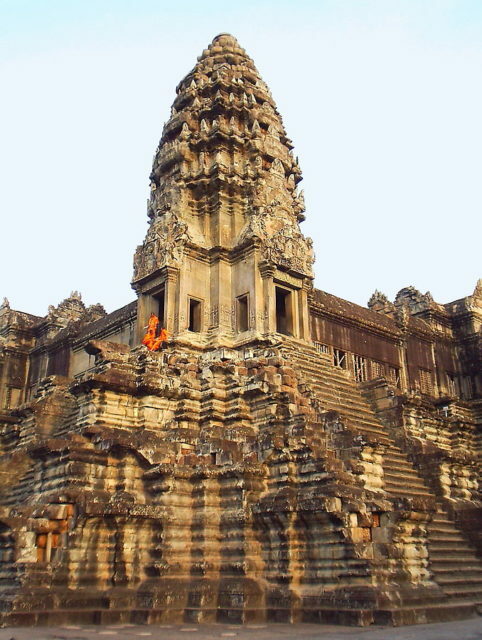 According to Cambodia’s government officials, the site was visited by half a million travelers in 2004. By 2012, the number of travelers stopping by the Siem Reap province to check out the glorious monument officially exceeded 2 million.